Nearly every one of the impressive displays can translate into a home landscape. I walked into the in Portland, Oregon, the night before the official opening, to photograph the display gardens. The crews were laying down cobblestones between the gardens, setting off the area from the rest of the show. Some men were up on lifts creating magical theatrical lighting that simulates sunlight by day or moonlight by night while the garden crews finished up last minute details and cleanup on their creations. Lights, camera, action! Ten dazzling display gardens include everything from installations with large arbors, furnished with plush garden furniture and stunning water features; to reflecting pond/bioswale planted with mostly natives. I wouldn't make a good quality judge; I can't choose a favorite. 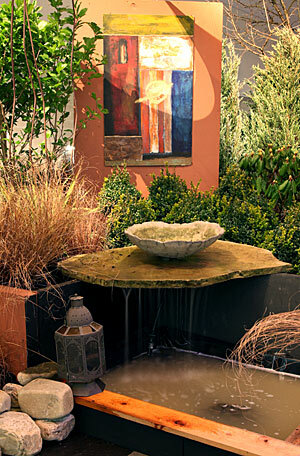 Nearly every one of the impressive displays can translate into a home landscape. 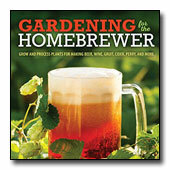 Unlike exhibits you see at a number of shows, they are either impossible, or impractical for the home garden. I equate them to an experience similar to going to the theatre, where the props and the acting are exaggerated for entertainment purposes. We may learn something and adapt it to our lives; however, we don't go home and act out the same drama. I enjoy the creative spirit behind the gardens; whether practical or not, they help inspire my own creativity. Here's a peak at some of the displays in store for attendees of the show. One of my favorites (I know, I know, I said I couldn't choose a favorite), "A Bridged View" by Dinsdale Landscape, is a mostly native garden with reflecting pond. Two squares are juxtaposed at a 45 degree angle. The larger square is hidden in the ground, filled with rock that acts as a natural filter for the 18-inch deep, reflecting pool and planted with spike rush (Eleocharis palustris). 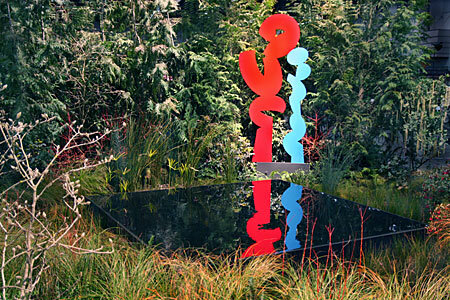 The colorful sculpture by Mel Kats and western red cedar hedge reflects in the pool. Although not my taste in sculpture, I know others who would find the startling contrast rather enjoyable. On the other side of the viewing bridge is another sculpture, more to my liking, by the same artist and planted with native red and yellow twig dogwoods. Alfred Dinsdale explained how this design can function as a watercourse designed to slow and collect water runoff, with the overflow directed to drywell areas that allow the water to percolate into the ground. Imagine how beautiful it would be if all runoff was collected with a system that also acts as a filter to pollutants that end up in storm drainage systems. Closer view of the bottom water bog planted with spike rush. Metal Sculpture by Mel Kats. This display, "The Runnel Spirit" showcases what you can do with a small space of 40 x 20 feet. It's a testament to a great design that packs in a pergola, three sitting areas with planting areas intertwined, and a water feature called a runnel, that unites all areas and ends in a sitting space surrounding the fire pit. Bridges of stone crisscross the runnel; an imaginative way to access the garden. The runnel is filled with blue glass. 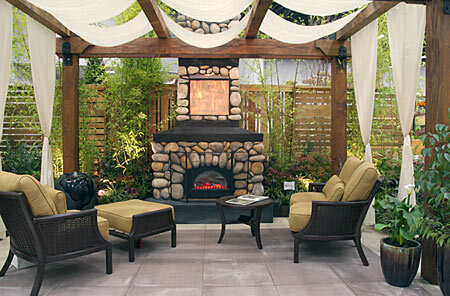 Matt Sander designed this space to be an outdoor room you can enjoy for three seasons. He likens the design to the "Old Portland comfortable, West Hills look." Who wouldn't be enticed to sit in the plush furniture next to a stone fireplace, under an inviting pergola? 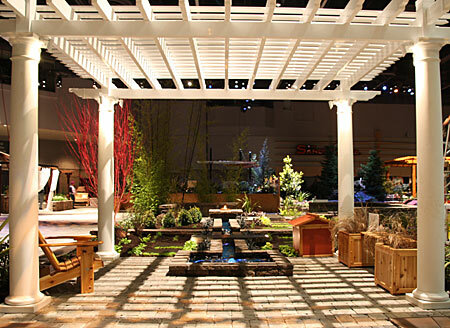 Surrounding the pergola are waterfalls and lush plantings in the containers and garden. There is no mistaking that this is an artist's garden. Every corner is filled with art, creative water features and furnishings. 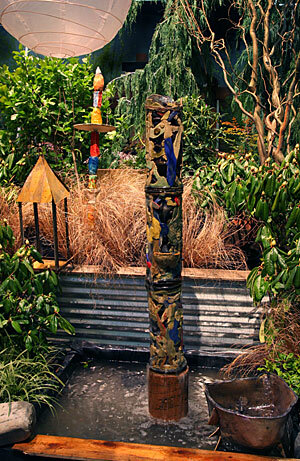 Jack Hays created the paintings and ceramic water features you find throughout the garden. It is a reminder that a Northwest garden is a canvas just waiting for us to fill with colorful art and plantings. This came close to being my favorite with the playful totem pole-like water feature. Hays certainly turned this display into a vivid cue that we can fill our gray northwest days with splashes of color. A closeup of ceramic water feature. More images of the gardens on Muck About a Northwest Garden.